Anyone up for a quick fish dish that looks sophisticated YET is very simple in terms of ingredients and cooking AND is actually nutritious? I was craving for that sort of dish more than a month ago, which led me to the nearby ALDI Markt (yes, there IS an ALDI Markt near my place, so my cheapskate heart was glad) to pick up some Alaskan pollack and Norwegian salmon fillet. And a bottle of citroensap (lemon juice). Fish. And lemon. What I was missing a lot that day was ADMU’s Blue&Gold café’s famous Grilled Blue Marlin in Lemon-Butter Sauce, but since I didn’t want to fuss too much about making the actual lemon-butter sauce, I just took those two flavor ideas together and came up with a simpler version. Thaw fish fillet, draining off excess fluid. Place in a shallow dish then marinade it with the rest of the ingredients (for at least 15 minutes) except for butter. On a non-stick pan (stove set to medium-high), melt butter. As soon as the melted butter clarifies, slide the marinated fillet in the pan. Let it brown for at least 5 minutes, then flip the fillet to let the other side brown for another 5 minutes or so. For the final “pan-seared” look, drizzle the fillet (while in the pan) with the lemon marinade and a small knob of butter. While sizzling, remove pan from heat. Preparing the marinated fillet. To save time, the fillets can be marinated in advance—lay the slices flat in a Tupperware box, seasoned and marinated with lemon juice, then stored in the freezer. Actual cooking time? At least 15 minutes, if the fish fillet is thawed properly. Cooking at medium-high heat has its disadvantages to half-thawed fish—outside, the fillet is just “too brown” (read: burnt) while inside, the meat is barely cooked. And I say at least, because I am a freak when it comes to well-done meat slices (fear of bacteria, really). Careful with the lemon! Let us just say a too-hot pan with fish and butter will not take well to the lemon marinade if the said pan is still on the stove. Did that once and ended up with a black oily mess that smells like I buttered my lemon fruit and stuck it in the oven at 350 deg C. Butter can quickly turn brown upon addition of an acid (this case, lemon juice), especially in high heat, which is something I wanted to exploit to give the fish fillet a “pan-seared” look. Fish = acid PLUS ginger. I can eat anything…as long as the odd “fishy” smell and taste are neutralized by the addition of acid (lemon or vinegar) tempered with ginger. And lemon + ginger taste good together. I don’t think I can source out blue marlin anytime soon and I’ve yet to make a proper lemon-butter sauce. But cooking bland, white-fleshed fish like the Alaskan pollack in this manner gave it a little oomph because of the lemon (with ginger undertones) and butter. A very healthy, delicious meal. I love it . 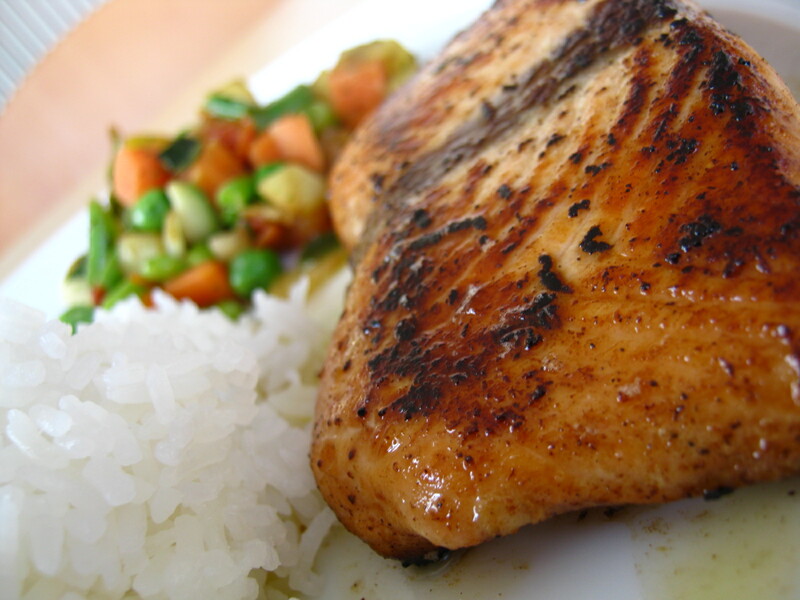 I would like to try this with tilapia filets. This works with the Alaskan pollack and Norwegian salmon…Kookie, you can try this with tilapia fillets (though my complaint about tilapia is that it’s not as “meaty” in texture as with the first two mentioned). Thanks! It does match well with rice! And I love how the lemon removes that fishy smell that I’m not too fond of.